The first 10 to 15 seconds after exposure to a hazardous substance, especially a corrosive substance, are the most critical. Delaying treatment by even a few seconds can cause serious injury. 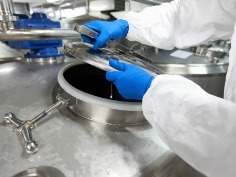 Emergency showers and eyewash stations provide on-the-spot decontamination, allowing workers to flush away hazardous substances that can cause injury. Levitt-Safety carries and maintains a complete range of emergency wash stations, eyewash and safety showers. And since the first few seconds after contamination are so important, it’s crucial that your eyewash stations and showers are in proper working condition at all times. 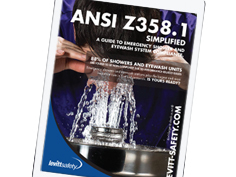 Our Fire and Life Safety Services team will ensure your emergency showers and eyewash stations are compliant with ANSI Z358.1 requirements and ready to function at a moment’s notice. Plumbed showers and eyewash units should be activated to verify proper operation each week and inspected annually to ensure that they meet the ANSI Z358.1 requirements. Not sure where to start? Let us help. At Levitt-Safety, our reviews consist of a comprehensive evaluation of the installation and condition of your equipment. A detailed inspection report documents all deficiencies and provide recommendations and possible causes for each of your emergency wash units. 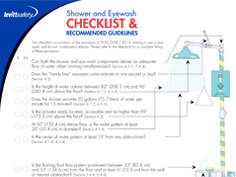 Our knowledgeable service technicians can provide complete annual inspections to ensure your emergency shower and eyewash stations are ready to use in the event of an emergency. During an annual inspection, units are tested to the ANSI Z358.1 annual requirements to ensure proper compliance, function and performance. With a large inventory of parts on-hand, Levitt-Safety is equipped to provide on-site service to your portable or plumbed system in accordance to the manufacturer’s specifications. See the resources listed below to learn more.